If you didn’t make it out to the Cleveland Museum of Art for CAR’s March 23 meeting you missed a great time! After an informal meet and greet, Historian Mary Hoerner gave a fabulous presentation on landscape architecture with an emphasis on the Fine Arts Garden, which serves as the front yard of the Cleveland Museum of Art. To see larger images, click the thumbnails below. Then Jill Tatem presented Bill Barrow with the 2010 Ohio Historical Records Advisory Board’s Achievement Award. We’ll keep you posted on plans for our next meeting. 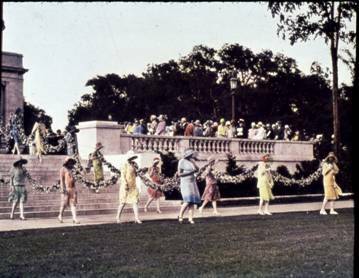 Please join us in welcoming spring at the Cleveland Museum of Art with a special presentation on Cleveland’s Fine Arts Garden by local attorney and horticultural historian Mary Hoerner. Mary conducted her research in a number of local archives and this engaging presentation is the fruit of her labors. Refreshments begin at 6:00 pm with Mary’s presentation at 6:30 followed by a brief business meeting. Please come early or stay late to enjoy the museum galleries on what we all hope will be a fine spring evening. RSVP to Leslie Cade at 216-707-2492 or lcade@clevelandart.org by March 18th.